As a part of my guest blogging gig for Britex Fabrics, they recently sent some of their new knit fabric to try out! 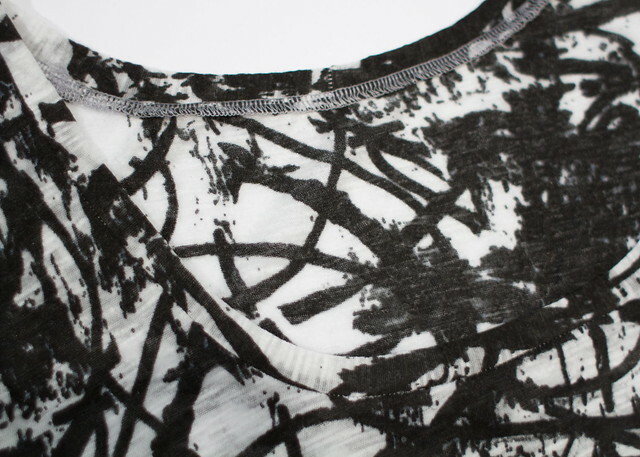 I was really excited to see that Britex is now offering knit fabric online, and for this project I picked out a super cool Japanese tissue knit with scribbles all over it. I thought it’d be a great fabric to turn into a simple tee using my favorite J.Crew shirt as a launch point, with plenty of my own modifications to get the perfect fit. 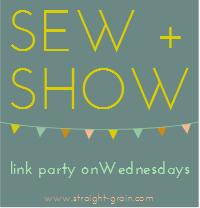 And because I want to share the love of my new favorite shirt all over blogland, I thought I’d offer a FREE PATTERN along with my tutorial today! I’m calling it the Scoop Top. It’s a scoop neck women’s t-shirt with a french/dolman sleeve. It’s fitted through the bust but then flares out a bit, giving it a really flattering and comfortable fit. I’m offering this free pattern in a size small/medium (since it’s knit, it’s pretty forgiving, size-wise). Please note: This pattern is untested (except by me) and it is offered in only one size. It’s also the first time I’ve ever digitized a pattern, so please don’t expect perfection! I’m happy to answer questions about it if you ask nicely. This pattern is for personal use only. I reserve the right to refine, grade it to different sizes, and charge for it it sometime in the future. In the meantime, Go To Patterns’ Casual Lady (affiliate link) has a similar fit in a full range of sizes and proceeds go to a great cause. Print out and assemble the PDF pattern. There are nine pages – three rows of three. 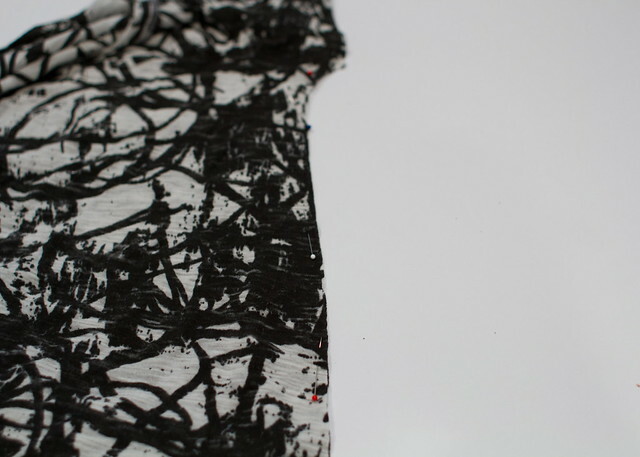 I like to trim off just one long and one short side of each page so I can overlap the pieces and tape accurately – I’ve provided thin margin lines to help you trim and align. At each intersection point, there are circles – match the proper circle pattern up, and refer to the diagram below if you need to. Page numbers should be right side up at the bottom. I flipped pattern pieces to minimize printing but if you keep the numbers on the bottom of each page, it shouldn’t get TOO confusing hopefully. Be sure to print at 100% (no scaling). 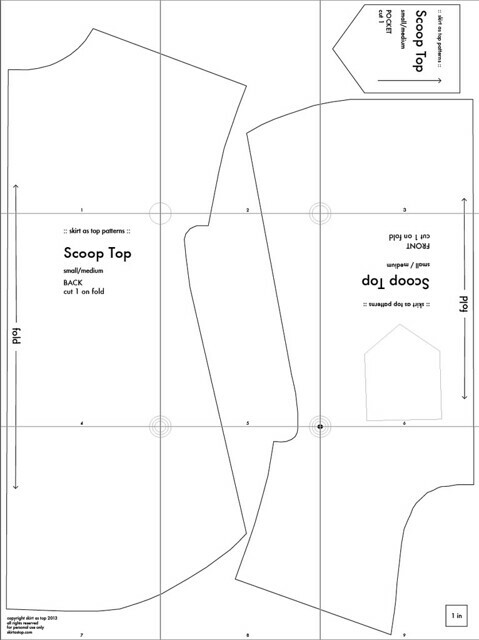 In addition to the pattern pieces you’ve cut out, also cut one 2″ by 25″ piece of fabric with stretch running horizontally for the neckband (most stretch along the long edge, not the short edge). If you have a high stretch recovery fabric, you might want to cut this a little shorter but it’s better to cut it a little long and shorten it if you need to later, rather than the other way around. If your fabric doesn’t stretch much, cut it 26″ long to be safe. You’ll want to stretch the neckband so it lies flat on your chest, but you don’t want to stretch it so much you distort the neckline. With tissue knit and lighter weight jersey knit, you’ll need to stabilize the shoulder seams, which get the most stress. 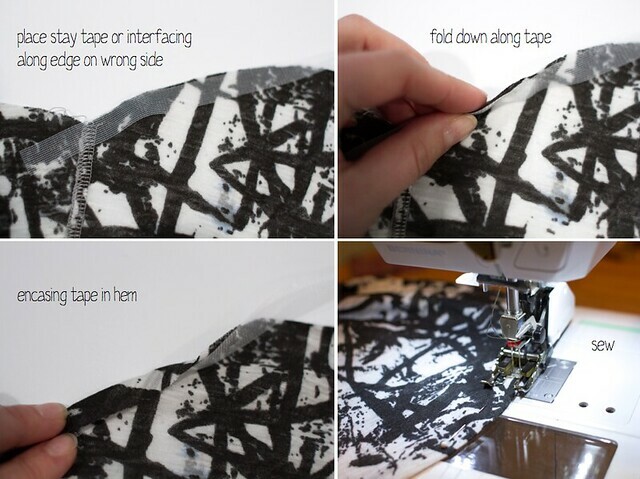 You can use either stay tape (found at most fabric stores), or thin strips of fusible interfacing (softer). I used stay tape here. Lay it across the wrong-side edge of your shoulder seam. Then pin it as you pin the shoulder seams right sides together. Sew/serge and carefully trim away excess stay tape. Press. Next prepare your pocket, if you decide to add one (I didn’t on this shirt since the print was so busy, but it looks great on a solid). 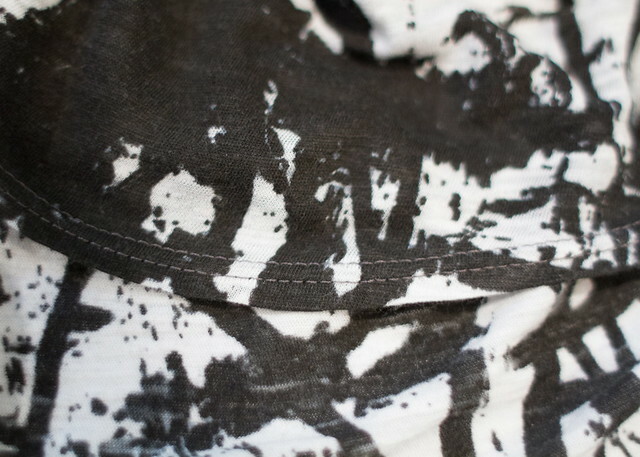 Use a water soluble pen/tailor’s chalk, mark pocket placement from the guide on the pattern on the wearer’s right side. 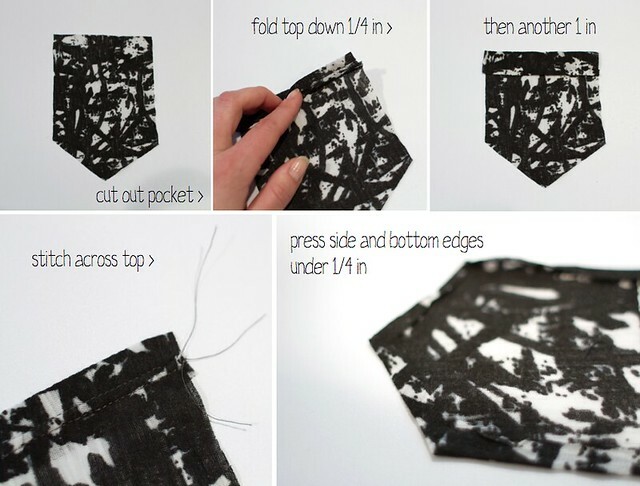 Pin around the sides and bottom of the pocket, and stitch it to your shirt. A walking foot is helpful here to make sure nothing puckers. Now prepare your neckline. Take your 2″ x 25″ strip of fabric, sew short ends right sides together, then press wrong sides together to form a 1″ wide neckband loop. Find the center of the neckband opposite to the seam. Mark it with a pin. 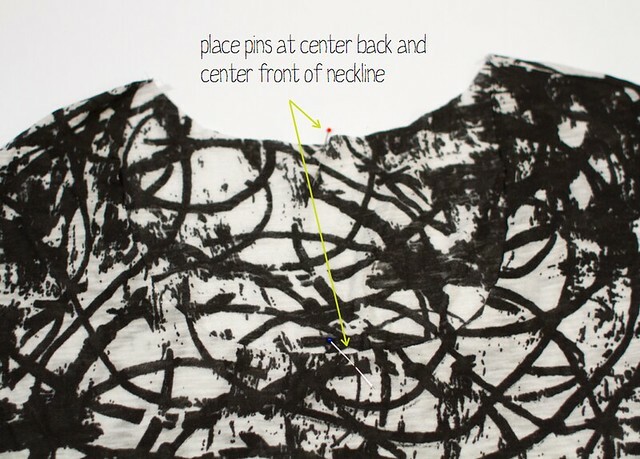 Also mark the center front and center back of your shirt’s neckline with a pin. Now you can match the center of your neckband to the front pin, and the seam of your neckband to the back pin. Pin the raw edge of the neckband to the neckline, distributing fullness and stretching the neckband evenly as you pin. Sew/serge the neckband on. Press seam away from neckband to finish, and topstitch along back neckband if you wish. Next, sew/serge the side seams, right sides together. I didn’t use stay tape here, since they are lower-stress seams. Your shirt is almost ready! Now to hem. I think sometimes with knit fabrics you can get away with sewing using normal woven methods, especially with interlock or other heavier knits. 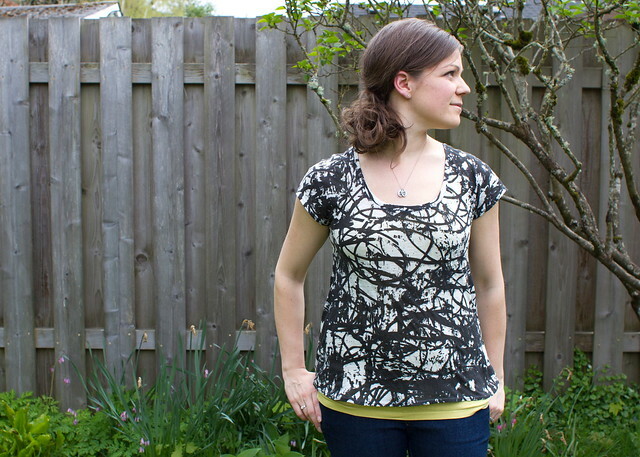 But with tissue knits and wiggly rayon jersey (which I made another version of this top in), you’ll want to pull out all the tricks so your fabric doesn’t get eaten by your machine. I used tissue paper under the fabric in the other version (see how in this tutorial), which worked well but I didn’t enjoy picking it out later. 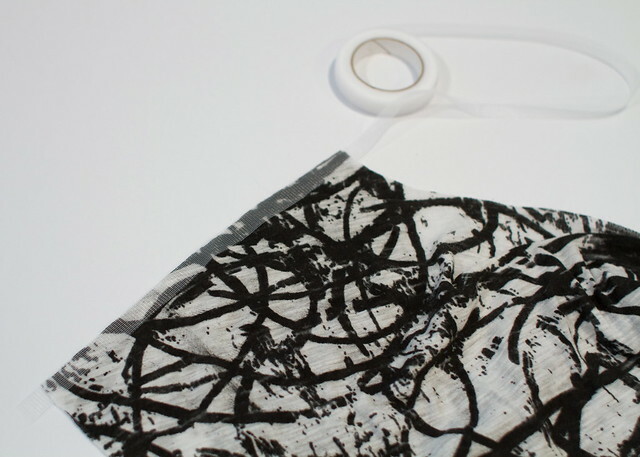 I’ve also used fusible interfacing in the past, which works too. Repeat this method to hem both sleeves. Carefully trim away excess stay tape so it’s not scratchy on your skin. And you’re done! It’s pretty much my perfect shirt – comfortable, flattering, great for layering, with just a slightly longer hemline in the back since I’m sitting on the floor and picking up kids a lot. I hope you make a Scoop Top too! 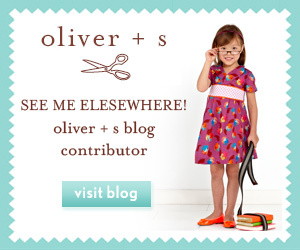 If you do, please add it to the skirt as top flickr group, I’d love to see! Thanks so much for sending me such fun fabric to work with, Britex!! This is so cute! And, good to know Britex carries that kind of fabric. I’ve been on a knit fabric kick lately. It seems like this top could also be easily extended to become a dress since you flared it out a little at the hem. I might have to try this since my goal for the summer is to find comfort as much as I can! Yay!! This looks great on you and I LOVE that fabric. I can’t wait to try it out! Cannot wait to make this! Thank you so much! such a cute top!! (and model!) Love that fabric, so fun. Such a cute top! I’m so impressed with your pattern making skills, good job! This is adorable! I can’t wait to make one! Thanks for the freebie! I want to sing you song right now. It’s by Whitney Houston. And it’s about you. And it rhymes with Crime Fevery Looman. Ooh, a scoop neck AND dolman/kimono sleeves! My favorite design elements – must try!! Thanks for the free pattern and tutorial, Kristin! 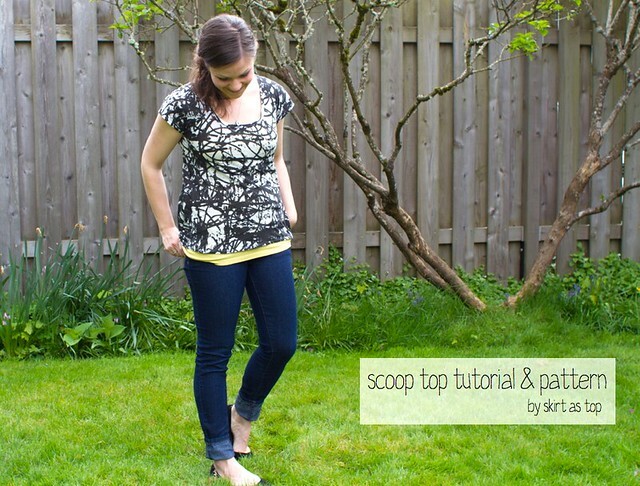 Wow, what a great top and tutorial, thanks for all the tips, I’ve recently purchased a lot of modal knits which are beautifully soft and drapey but I think I’ll need to use all your tips to have them turn out well, yay you! you’ve been busy! Love the fabric you picked and thanks for the free pattern. Love the idea of the longer hem in the back! Yay! 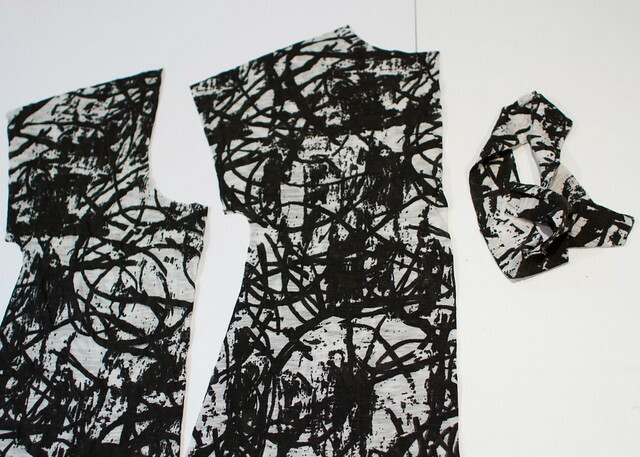 Good for you for your first digitized pattern! And how generous you are to offer it as a free download:) Your tee looks beautiful – great job! Thanks for the free pattern! I love that print! YOU ARE SO AWESOME!!! 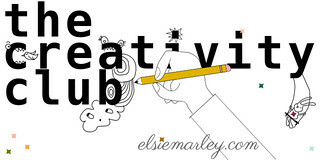 Nice work, girl – I’m super impressed both at your designing skills (which I already knew about) and your new illustrator skills. Teach me! I love this top. I’m curious how easy/hard it would be to scale it up to my size. I might give it a try (someday) and I’ll let you know!! Congrats Kristin, this is HUGE! That does look like a comfy shirt with a great fit, I especially love the fabric you chose! Thanks for sharing your pattern with us, cheers! woohoo!! 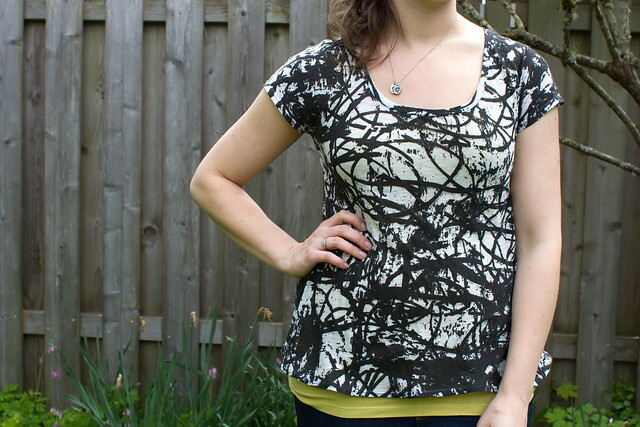 nice top, and love the pattern…can’t wait to give it a try! This looks awesome! 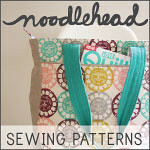 I can’t wait to try it and am totally excited that you are experimenting with pattern making. love this, kristin! i think i’ll try it for the girls first…they are both a women’s smalll. thank you for sharing. I’m in! I’m definitely adding this to the to be made pile! It looks fantastic! WOOHOO! Look at you. Cute-as top and you are totally styling Miss Kristin! See, you can work the camera! Hey, big congrats on figuring out how to computerize your own pattern, I’m sure this will open up a whole new world of fun for you. It looks completely over my head but something I’d like to try one day. Nice one lady! Proud face! Yeah!! You’re awesome! 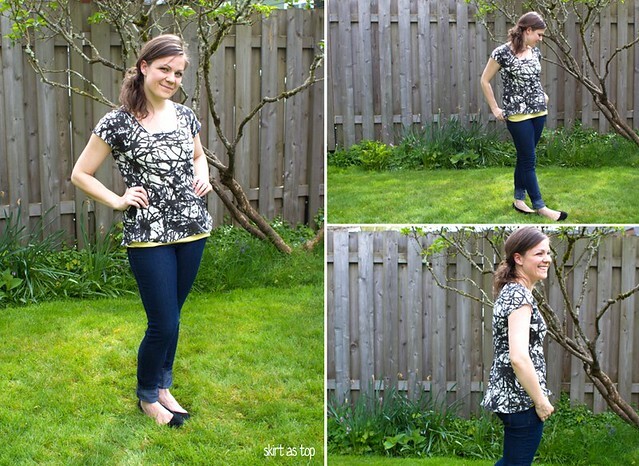 The top looks great – the pattern is super impressive – that fabric is fabulous! Really looking forward to trying this out, thankyou for the free pattern. What seam allowance is there on this? 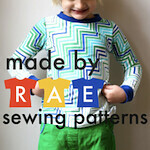 Congrats on your first digital pattern! Would love to try it out, maybe adding some length for Gungie proportions! Kudos! Hi, I’ve made it! And it is absolutely fabulous!!! Thanks! Thanks! Thanks! Hello Kristin! Thanks for the pattern, I just made one and I’m wearing it now at work :). I blogged it here: http://girlwithasewingmachine.wordpress.com/2013/05/06/skirt-as-tops-scoop-tee/. It looks soooo good! I love it with shorts! What a great print you chose too. Thank you!! I sized it more like ready to wear – I don’t have finished measurements (and those are tough anyway on knit since it stretches) but I wear a size small or medium store bought, depending on the brand and the fit of the shirt. In Rae’s Washi Dress, I’m a medium. But I think it will fit true “smalls” just fine, it’ll just be drapier on them. If you’re unsure, maybe try a muslin in a men’s thrifted t-shirt just to see whether it will work on you? This top is so wonderful. It has the best mix of fit and drapey and it is just the thing I’ve been searching for to hide my post-baby belly. I made one tonight and I love it so much that I’m planning on making several more right away. Thank you for sharing! The pattern looks great! I can’t wait for it to be available in larger sizes! 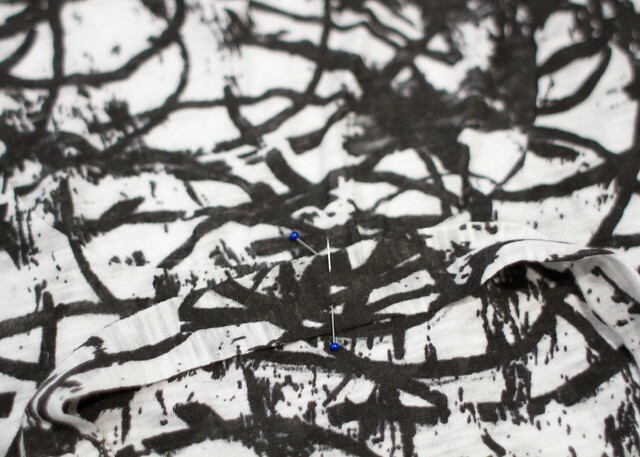 Thanks for the pattern – Can’t wait to make it! I could not download the pattern. I would click on it and nothing would happen, if there is a tip please let me know. I would love to make the cute top you have designed. Thank you so much for sharing. Thanks so much for sharing, I love this top! I love this shirt and really want to make one but I am more like a size L/XL. I checked out the link to Casual Lady but I don’t care for the sleeves on that shirt. Do you have any recommendations on how to resize this to fit me? Perhaps a good resizing tutorial or something? Thanks for the inspiration! thank you for the pattern and tutorial! Just made one, and I love it. Can’t wait to sew a few more. Thanks so much for this pattern! I adjusted it up to a size XL and made my first ever t-shirt with it, which turned out pretty well! I’m very late to the Scoop Tee party, but oh so happy I finally arrived! So pretty! Do you think this could be made in a woven, as well? I could add buttons…. how do you think the fit would be? yaaay – my first successful make with knit fabric! So perfect, thank you for so generously sharing it for free too. I can’t get the pdf pattern….The link is broken… Is it possible to send it to me please ? Working on my 4th top. Do just a little bit different on each one. Thanks for such a great pattern and one that can be customized. I’m going to try to use this pattern, but I’ll need to adjust it to have a v-neck since I have to wear v-necks. I wear a stoma bib & they’re not big enough for scoop necks. But thanks! Thanks! Made this today with some tissue knit I had in my stash. Despite the annoyance of working with the tissue knit, it came out nicely- beautiful pattern and you can’t beat the price!